In Walnut street, (Price Twenty Shillings) A NEW and most correct Draught of the Coast of North, and Part of South Carolina (ever published) including the Bar and Harbour of Charles Town, describing all the Shoals, Soundings, Bars, Harbours, and Settings of the Currents; together with compleat Directions for sailing along the Coast, and into all the Harbours, from the Capes of Virginia to Charles Town. The chart was advertised in the Boston Gazette in mid-September of that year (transcribed below) and in Charleston, SC, newspapers the following month. Interestingly, the Boston Gazette advertisement refers to the “late Daniel Dunbibin.” No other information has been found to confirm a date or place of death for Daniel Dunbibin. If there are any genealogy researchers reading this, we’d love to know if you can find more details. You can use the “What’s on your mind?” comment box below. Neither the Boston nor Philadelphia advertisers were engravers or printers; they were both general merchants. Unfortunately, there is no known surviving example of Dunbibin’s 1761 chart of the coast of the Carolinas. The engraver and printer of the chart remain unknown. Nicholas Pocock was a well-known British maritime artist in the early 19th century. As a young man, he had been master of a merchant ship that sailed between Bristol, UK, and Charleston, SC in the late 1760s. Pocock published a chart of the Carolina coast in 1770, believed to have been engraved and printed in Bristol. With the exception of a reference to it by Le Rouge on his 1777 chart of the Carolinas, there was no knowledge of Pocock’s chart and no known surviving examples… until 2017, when Boston Rare Maps acquired one. Further research located a circa 1980 photograph of a 2nd state (1781) of Pocock’s chart. This chart was in the collection of the National Maritime Museum in Greenwich, UK. Unfortunately, they no longer know its whereabouts. Pocock’s 1770 and 1781 charts show a row of 12 trees along the Grand Strand. So, who “planted” these trees? If Norman copied the trees from a surviving copy of Dunbibin’s 1761 chart, then Pocock obviously also had a copy of Dunbibin’s 1761 chart and copied the trees from that chart. Could the trees have originated with Pocock’s 1770 chart? That possibility implies that Norman didn’t copy Dunbibin entirely, and that he obtained the trees from Pocock’s 1770 chart or Le Rouge’s 1777 chart. No copy of Dunbibin’s chart has surfaced in Bristol or anywhere else, while the only surviving copy of the first state of Pocock’s chart was found in the Boston area. Norman’s chart was printed in Boston. Coincidence? 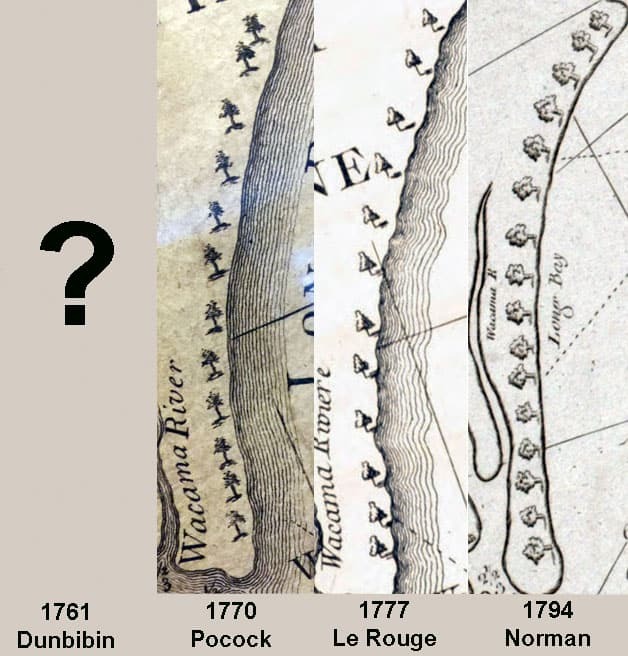 Unfortunately, we’ll never know if Dunbibin or Pocock was the tree planter unless a copy of Dunbibin’s 1761 chart surfaces. Thankfully, the world will continue to rotate even without an answer. Do you have information about these charts you’d like to share? Comments or Corrections? Please use the “What’s on your mind?” comment box below. If you’d like to read more about Daniel Dunbibin, good luck! You may find a few stray facts searching the variant spellings of his surname that I have found: Dunbibin, Dunbibbin, Durbiben, Dunbiban, Dunbibon, Dinbibin, and Dimbibin. If you’d like to read more about Nicholas Pocock and his chart, please see Michael Buehler’s writeup on the Boston Rare Maps web site. Le Rouge’s chart of the Carolina coast, for which he gives credit to Pocock. This entry was posted in 18th Century, Decorative Elements, Map Advertisements and tagged Daniel Dunbibin, John Norman, Nicholas Pocock by crmaps. Bookmark the permalink.